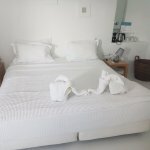 El precio que has encontrado es un 13 % más bajo que la tarifa media de este hotel, que es de 348 US$ por noche. Thank you so much for the amazing feedback!We are so blessed to hear that you had a pleasant stay here with us. Your kind words about the beautiful location of our hotel and our staff make us feel so grateful. We will always be more than happy to assist with any need and request you have in order to make your holidays a memorable experience. We look forward to hosting you again anytime soon. Una experiencia inmejorable, el hotel es muy cálido y con detalles de muy buen gusto con la arquitectura característica de la isla. Las habitaciones son muy net pero super confortables con una vista a la caldera inolvidable. Sus tres piscinas todas con vistas espectaculares; el desayuno de una variedad y calidad de excepción; y la excelencia en la atención y profesionalismo de su personal nos hicieron vivir una experiencia perfecta. No puedo dejar sin destacar la atención, calidez y simpatia de Maria en la recepción resolviendo todas nuestros pedidos e inquietudes; como la buena onda y predisposición de Giannis. Felicitaciones !!! servicio al cliente en su mas pura expresión en un hotel increible. Consejo sobre las habitaciones: recomiendo las habitaciones con vista a la caldera. Thank you so much for your great review! I could not be happier to hear that you had a memorable stay here with us. Rocabella is indeed located at one of the most breathtaking spots of the volcanic caldera offering marvelous views of the Santorinian sunset. Your positive feedback about our staff and our facilities make me feel humble and appreciative. I am also grateful to hear that you did savor our dietary suggestions. They are carefully selected and crafted by our chef in order to offer you a delectable experience. Having said that, let us offer you a 10% loyalty discount towards your accommodation expenses if you wish to book your holidays with us next year. We look forward to welcoming you again anytime soon ! Un hotel con todo postivo, un servicio maravilloso. Tiene unas hermosas vistas desde la habitacion. La recepcion es muy buena y muy cordial todo su personal. Merece una mencion especial su restaurante, en el que la cena es muy romantica y con una comida gourmet. El personal es muy amable y dedicado a hacerte sentir muy comodo y mimado. Su servicio de transfer es muy bueno. Las mucamas muy atentas y serviciales. Consejo sobre las habitaciones: Todas las habitaciones son muy lindas. Thank you for taking the time to review our hotel on TripAdvisor. It was a great pleasure and honour for us to welcome you and host you on our premises. Indeed, Rocabella is situated at the most scenic location of the volcanic Caldera and it offers our guests the privilege to witness every afternoon the majestic sunset of Santorini. We feel grateful that you cherished those moments of tranquillity and bliss and you enjoyed the view from your balcony. A warm welcome and a heartfelt smile are the basis of our hospitality principle and we generously offer them to all our guests. We are so appreciative that you mention that in your review. Moreover, we thank you dearly for your special reference to our restaurant service. Being friendly and dedicated to fulfilling our guests’ needs and meeting their expectations is our sole intention. We feel really pleased that you treasured your romantic dinner at our dining area and you were pampered by our staff’s special care. Furthermore, we were excited to read that you approve of our breakfast suggestions and you find them excellent. They are all based on the Greek Mediterranean cuisine and we will be more than happy to offer them to you anytime in the future. Housekeeping is pivotal to us. All our guests are entitled to the luxury and comfort of their immaculately clean and elegantly decorated rooms. We are so happy that you remained satisfied with our maids’ attentiveness. In addition, our shuttle service was at your disposal upon request anytime and we feel appreciative that you found it very good and convenient. Rest assured that from now on Rocabella Santorini will be your new home in Greece and we shall be very happy to host you again soon. Having said the, allow us to offer you as a token of our gratitude and appreciation a 10% loyalty discount towards your accommodation expenses if you wish to book your holidays with us next year. Las instalaciones del hotel son muy bonitas y tiene muy buena ubicación en la isla cerca de Oia y Fira. Cuando llegas te hacen un tour por el hotel, te enseñan las impresionantes 4 piscinas y donde se ubica el restaurante para el desayuno (todo muy rico). Además te ofrecen vino y fruta de bienvenida (exquista por cierto). El personal es fantástico, son súper atentos y siempre se preocupan para que tu estancia sea maravillosa. No tengo ninguna pega, incluso la chica que nos arreglaba la habitación Anna, fue super amable con nosotros. Eran todos encantadores. 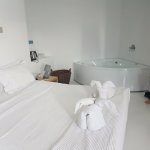 Nosotros teníamos la habitación con jacuzzi y vistas a la caldera. La habitación era amplia, con otra cama en la parte superior a la que se accedia por unas escaleras y jacuzzi en el interior también. 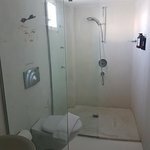 Cuando llegamos el jacuzzi no iba, lo estaba reparando, nosotros teníamos 3 noches reservadas pero sólo pudimos utilizarlo el último día. He de decir también que como nuestro jacuzzi no funcionaba, la segunda noche nos ofrecieron el del gimnasio, muchísimo más amplio y con una ambientación super bonita (velas, vino y fruta). 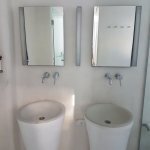 Por otro lado, la habitación me parece bonita pero creo que necesita una reforma, pues uno de los lavabos no tragaba bien el agua, el suelo tenía como desconchones, la alcachofa de la ducha funcionaba perfectamente pero los chorros no iban y en alguna que otra ocasión encontramos hormigas por la habitación. La habitación, eso sí,estaba siempre recogida y todo colocado, del servicio no tengo ninguna pega vuelvo a reiterar. En definitiva, las instalaciones del hotel son preciosas, la comida exquisita y el personal inmejorable, pero en cuanto a la habitación... me esperaba más por el precio que tiene. Thank you for taking the time to review our hotel on TripAdvisor. It was our pleasure and honor to host you in our premises. A heartfelt welcome by our front office staff is the basis of our hospitality. A bottle of Santorinian wine along with a freshly made fruit salad was the token of our appreciation and gratitude upon your arrival. We treasure our guests like gold and we are so excited that you cherished our gesture. We feel so grateful that you approved of our welcome service and our tour around our hotel. Indeed, Santorini is a magnificent place to be and an idyllic holiday destination. Being attentive and caring to make your holiday a wonderful and memorable experience is our sole intention and goal. So, I was content to be informed that immediate action was taken when you experienced an issue with your plunge pool. As you so kindly point out in your review, you were provided with our gym jacuzzi double the size at your absolute disposal to use. We are so appreciative that you acknowledged our offered and that you really enjoyed it. We do appreciate your constructive feedback on our rooms’ maintenance. It is compatible with our interminable effort to redecorate and renovate our premises to meet the standards and expectations of our guests. We thank you so much and we take it under serious consideration. All our guests are entitled to heavenly bed comfort and immaculate room arrangements. We make sure that these standards are well attended, and we feel so proud for your generous comments on our housekeeping staff Anna whose kindness and diligent work guaranteed to you an excellent stay. Rest assured that from now on Rocabella is your new house in Santorini and we shall expect to host you with pleasure anytime in the future. Having said that allow us to offer you as a token of our gratitude a 10% loyalty discount towards your accommodation expenses if you wish to book your holidays with us next year. We are all looking forward to hosting you next year. Es increible. Las habitaciones fantasticas, las vistas inmejorables y su gente super atenta. Fuimos a una habitacion con vistas a la caldera ,impresionantes, las mejores de la isla. El desayuno completisimo. Especial mencion para su maitre; gracias por estos dias inolvidables. Hello from all of us here at Rocabella Santorini! It makes us so happy to read your lovely comments and we are very grateful to you. Thank you for sharing your wonderful experience and all of your warm words will be passed on to the team here, especially the maitre, who will be very proud to read them. It was truly a pleasure for us to share our hospitality with you and we hope to see you again in the future so that you can enjoy more of Rocabella.